I’ve found myself with some unexpected free time on my hands this week. While dealing with an open schedule is a little disconcerting, it’s also a welcome opportunity. It’s important to find those spaces in your day where you can relax and do at least one thing that you want to do for yourself. As you may have guessed, my moments tend to be food-related. Yes, I do have times where I sit quietly and think, or try not to think, but there are those days when all I want is fresh-baked bread. Made with my hands, baked in my over and wafting heavenly smells all through the house. This week saw me working on several of those must-haves until I discovered something that I didn’t know I was craving until I almost bought it. Seeing that Bear Naked granola was on sale, I went to put a bag in my cart when I looked at the price. Yikes–I just bought a whole huge bag of organic oats, and they weren’t even close to four dollars. 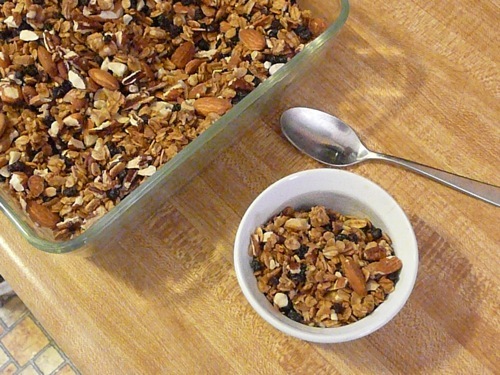 Granola, I thought, it’s been a long time since I’ve made that. I love a good basic recipe, a sort of solid structure that can withstand a little bit of renovation. I search for this type of recipe again and again to use as a jumping-off point for my revisions. This is the way to cook–there’s no need to reinvent the wheel, but start with the tried-and-true and make it your own. I found this recipe, added some currants and toasted nuts after baking, and a dash of cinnamon. It made my house smell just like maple sugaring season (which, coincidentally, it is) and warm oatmeal cookies. Maybe you don’t need to take a moment to make granola this coming week, but at the very least, take a deep breath and enjoy a quiet minute.